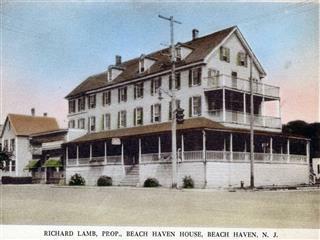 More than a century ago, one of Beach Haven’s original hotels was erected on the corner property where Buckalew’s now stands. Built in 1874, the Bayview House stood on the edge of the marshes at the entrance to Mud Hen Creek, now Dock Road. Boats ferrying supplies to the resort traveled through this waterway, tying up to the Bayview’s porch railings at the end of their journeys. Bayview House was renamed the Beach Haven House in 1883 by its new owner, George Bates, whose daughter Lily, the local schoolteacher, taught her students in the lobby until the new school on Third Street (now the Baptist Church) opened in 1894. 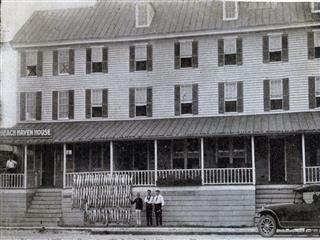 In 1890, Henry Mulholland bought the hotel in 1890 and it continued to be most popular with the fishing crowd, who slumbered in the cots that lined the hallways of the upper floors for $1 a night. Then in 1920, Richard Lamb of Mt. Holly became proprietor, followed by his son who shifted the establishments focus to food. 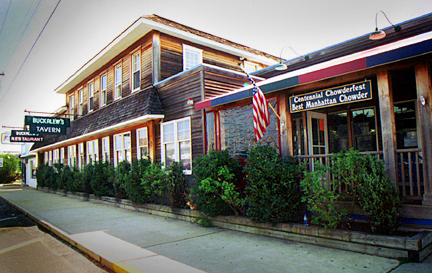 Tom & Munci Buckalew, with family in tow, bought the place in 1949, and made it famous for tomato pies and soft shell crabs. A favorite watering hole for the locals, Buckalew’s hosted the Beach Haven Life Guard’s Ball, the “society” event of the summer. Jay Cranmer, who grew up eating those tomato pies, and wife, Lyn, acquired Buckalew's in 1996 and teamed up with local builder James Tallent to renovate and expand Buckalew's. The renovated restaurant & tavern reopened June 21, 1996. A new kitchen, three dining rooms (one is the tavern with 20 taps for draft beer) and a sushi bar accommodate the varied tastes of local and visiting patrons. Culinary school graduate, ardent fisherman and General Manager Allan Menegus (and co-owner) joined the team in 2000 and brought with him a focus on sustainable ingredients and locally procured seafood and produce. Chef Allan's team include fellow culinary school graduates Chefs Shelby Cadmus and Ernesto Oquendo, who create and prepare Buckalew's extensive menu of fresh seafood, steaks, chops and comfort fare ... and, of course, the famous tomato pies.